It's upon us--that season in the sun. (Ahh, the summer time). This summer, if you plan to travel to a Caribbean beach or to an exciting city far from home, I wish you safe travels. And if you decide to stay close to home, Enjoy! Have big fun. Celebrate our rich culture at some great places all around the USA. 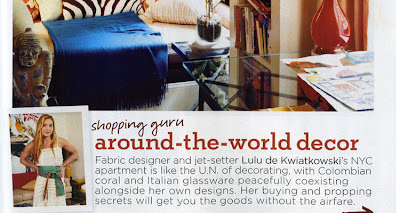 Inspired by Domino magazine’s “Around the world décor” article that appeared in the April 2007 issue, I invite you to join me this week as I celebrate the culture and environment in which wonderful tableware is created as well as the people who create them all over the world. This week at Toast and Table’s is a celebration of travel and today we’re traveling to Mexico City to explore DFC. 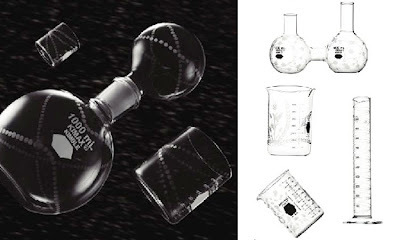 (l to r): Decanter $356.00, drinking class $55.00, shot glass $41.40; Science series vases – 4L Beaker vase $495.00, 2L Beaker vase $227.00, Prega vase $495.00, Tall vase $39.00, The Future Perfect, 718-599-6278. (above: image from Domino Magazine, June 2006. 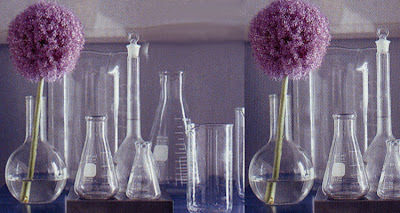 Instant collection, glass beakers, their unusual shapes and measurement markings are the epitome of geek chic - and they have an airy sophistication). DFC is dedicated to the marring of traditional Mexican techniques and styles with modern design to create objects for home and commercial use. They are currently working with artisans from across Mexico in materials ranging from aluminum, hand-blown and scientific-grade glass, traditionally-cast ceramics, to fiberglass, silver, and fur. DFC is proud to collaborate with artisans utilizing techniques that in many cases have remained unchanged from millennia, and with families whose expertise often dates back through generations. 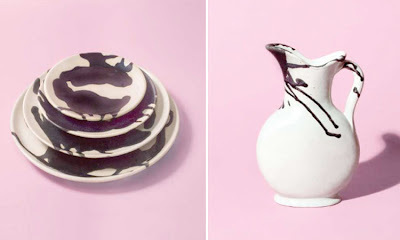 (l to r): Explosion series dinnerware plates (hand-glazed stoneware) – charger, $80.50; dinner, $57.50; salad, $34.50; cake, $34.50; pitcher, $92.00. A Toast to Summer! In many cultures, toasting is common and to not do so may be a breach of etiquette so “Salud” to Mexico! They carry unique, hard-to-find items from artists and artisans around the world. Thanks Ladies for stopping by and thanks for the tip on Novica, I must check out the site. Hey Katie, the polka dotted bowls are from DFC as well, aren't they great. 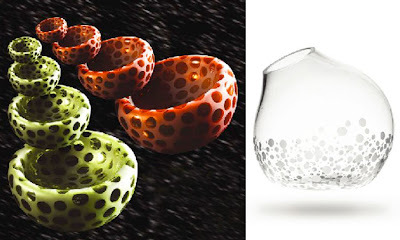 They are mouth-blown from recycled glass with mirror finish and cork base. The price is $138.00 and can be found at The Future Perfect. I love the polka dot bowls.